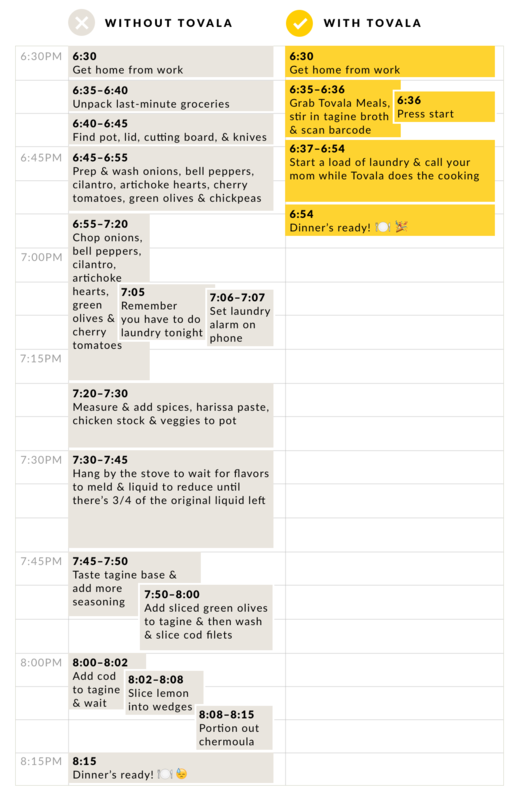 Tovala Meals save you a lot of time and energy on a busy weeknight. To show you how, letâ€™s walk through what it takes to make Moroccan Fish Tagine on your own versus with Tovalaâ€™s help. For a good idea of what goes into this dish, check out the photo below on the left. All of that becomes the final meal you see on the right! This Moroccan Fish Tagine is our take on the traditional Moroccan stew, featuring black cod. However, it still incorporates the dishâ€™s signature balance of sweet and savory flavors. Itâ€™s filling, perfect for cooler weather, and weâ€™re big fans! Weâ€™re not anti-home cooking. The fact that you can cook your own food in the Tovala is a testament to that! But itâ€™s also really nice to have a home-cooked meal thatâ€™s delicious, healthy, and a complete no-brainer. Check out what other Tovala Meals weâ€™re serving up and look out for our Moroccan Fish Tagine!